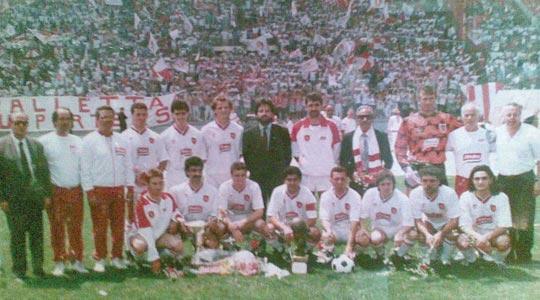 Valletta FC, winners of the Premier League title in season 1991-92. In 1991-92, Ħamrun Spartans started their defence of the league title on a somewhat unsure footing. The Spartans, however, soon shook off their early difficulties, rediscovering the rhythm that made them worthy champions the previous season. Once they got into their stride, the Reds were soon made favourites by the punters to retain the title. Those were the good old days of football in Ħamrun. The Reds, however, were in for an unpleasant surprise when their old rivals from Valletta started to show their bold intentions to challenge for the league crown. Apart from Valletta, the other title contenders that season were Floriana and Sliema Wanderers. As for the other six contestants, it was evident from the very start that their main objective was to avoid relegation to the First Division. Rabat showed a vast improvement on the previous season. The Magpies were the first team to ease their relegation worries. They were followed past the safety mark by Hibernians who, after their customary dismal start, recovered well to move up to a healthy mid-table position. Birkirkara, relying on a sound defence, pulled clear of the danger zone early in the second round, leaving Luxol St Andrew's, Żurrieq and Mqabba in a three-way fight to beat the drop. Mqabba started the competition full of promise. Then, as the season progressed, their fervour petered out and they were the first to be relegated. Żurrieq and St Andrew's put up a stronger fight and at the end of the competition, both teams finished equal on points. The issue had to be resolved with a decider. Żurrieq beat Luxol 2-0 to condemn their fellows-in-distress to the First Division. The relegation battle was very interesting that season but it was not half as exciting as the quest for the league title. Valletta staked their claim for the title from the early weeks of the season. Winning one game after another, the Lilywhites claimed top spot in the table and held on to it until the last kick of the competition. Ħamrun Spartans kept up their challenge until the midway point of the second round when a string of disappointing results forced them to relinquish their grip on the championship crown. Floriana's challenge did not last long. By the end of the first round, they had lost the impetus and the drive that could have led them to the championship. Ħamrun's wobbles and Floriana's surrender left Sliema Wanderers as the chief challengers to Valletta for the title. However, the Blues' inconsistency shattered their hopes of stopping Valletta's march. The Wanderers lost their two direct encounters with Valletta. This left the Blues in a very difficult position and another defeat to Rabat in the latter stages of the league campaign effectively handed the championship to their rivals on a silver platter. This surprising result was followed by another lifeless performance against Floriana which even cost the Blues a place in the UEFA Cup. The convincing manner with which Valletta FC won the championship was the main highlight of the season. Led by coach Tony Grech and backed by a hard-working committee under the presidency of Joe Caruana Curran, Valletta brushed aside all competition. The Citizens finished the league campaign unbeaten, dropping only three points in the process. This was the 14th league title to be won by a team from the capital and the 12th for present club, Valletta FC.